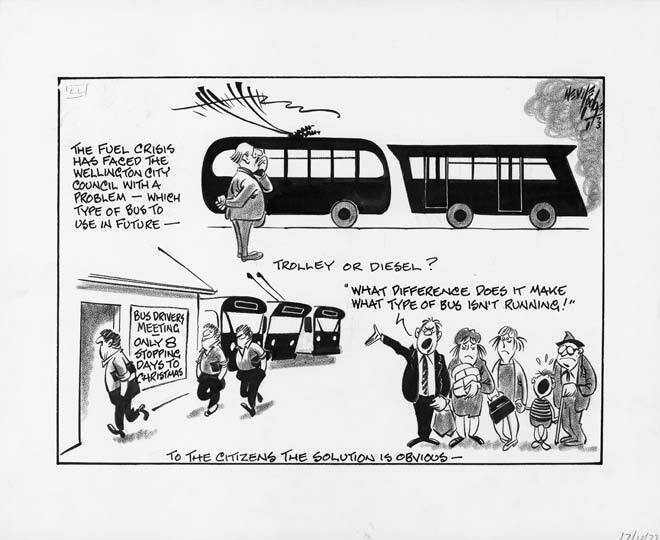 In this 1973 Nevile Lodge cartoon, Wellington City Council debates the relative merits of trolleybuses and diesel buses. But the public says it doesn’t care about the type of bus as long as it is running, not cancelled because drivers are holding stop-work meetings during industrial disputes. The cartoon appeared in Wellington’s Evening Post on 17 December 1973, and the billboard for the drivers’ meeting points out there are ‘only 8 stopping days to Christmas’.